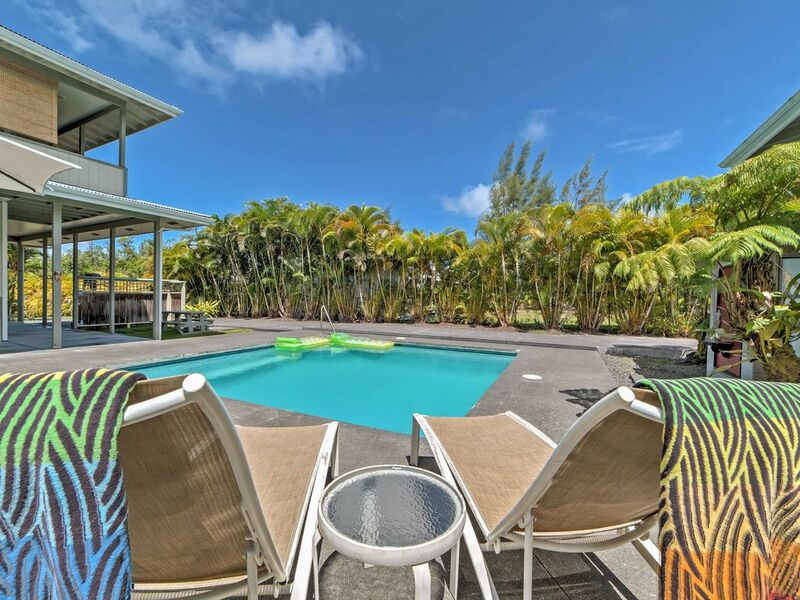 Spend a relaxing Hawaiian getaway, far from all the tourists during your stay at this vacation rental studio in Keaau. Located on a large piece of property, this studio is the ideal romantic retreat for you and a loved one! During the day, you can explore the forest and visit nearby beaches, and on clear nights you can lay by the pool and stare at the brilliant stars up above. The sliding glass doors and windows in the studio open up directly to the pool and patio area. Keep them open throughout the day and night to feel the warm Hawaiian breeze! Put your swimsuit on and hop in the pool after a fun day exploring the area! The refreshing water is the ideal way to cool off after a hot hike through the nearby forest reserves. During your stay, you can make quick snacks and reheat your leftovers in the microwave! If you’d rather eat in than dine at the fabulous restaurants in the area, use the charcoal grill to cook your favorite meats and veggies. After dinner, head out to the pool or yard and look up at the stars. On crystal clear evenings, you’ll be able to see all of the constellations in the Milky Way! You’re sure to sleep well in the comfortable queen-sized bed during your stay. Open the sliding glass door and drift to sleep smelling the tropical Hawaiian air each night! If you ever decide to leave the pool area, you won’t be far from all of the fun attractions and amazing adventures the island has to offer! The studio is just 20 minutes from downtown Hilo, which has fabulous beaches, restaurants, farmers markets, and shopping opportunities. Take a 2-mile hike to Shipman Beach and enjoy a wonderful daytime picnic. You can also walk from the studio to the rugged and gorgeous Puna Coast. If you’re feeling a bit more adventurous, drive 35 minutes to Hawaii Volcanoes National Park to experience breathtaking views and fabulous hiking opportunities! The studio is 15 minutes away from historic Pahoa Town, which has a number of restaurants offering tasty local fare. Once the sun sets after dinner, continue driving to Kalapana to watch lava flow into the ocean! - Amenities include a well-equipped kitchenette, private pool, patio with patio furniture, charcoal grill, flat-screen cable TV, free WiFi, outdoor shower, covered parking, and much more! - Ideal Keaau location on a secluded lot with a private fence - Spend your days swimming in the pool or drive a few miles to amazing beaches, great hiking destinations, and fabulous local attractions! I had a wonderful stay. The pool is beautiful, the room has nice breezes and has everything you need. Great! Clean, comfortable, and cozy in a secluded setting. I would love to return to this property! The owners are incredibly welcoming and kind. The pool was perfect!